The story of Lily (Kempson) McAlerney and her role in the 1916 Easter Rising. Lily (Kempson) McAlerney the day she took her oath to the Irish Republic. The back of the original print is stamped with the date 22 Aug. 1914, Belfast. Lily (Kempson) McAlerney is front and center after this group took their oath to the Irish Republic, 1914. Others in the picture are Marie McKeown, Aideen Ward, Kitty Shells, Ina Connolly and Alice Kavanagh. The flowers in Lily's uniform were in the photographer's waiting room, and she put them in her pocket for the picture. Told she couldn't do that, Lily responded that, yes, she would. Lily (Kempson) McAlerney is to the left of labor leader James Connolly at the May 1914 meeting of the Irish Trades Union Congress in Dublin. Lily went to Belfast after Connolly said he could find her work, and lived with his family. She later came back to Dublin where her family near Whitefriar Street Carmelite Church. 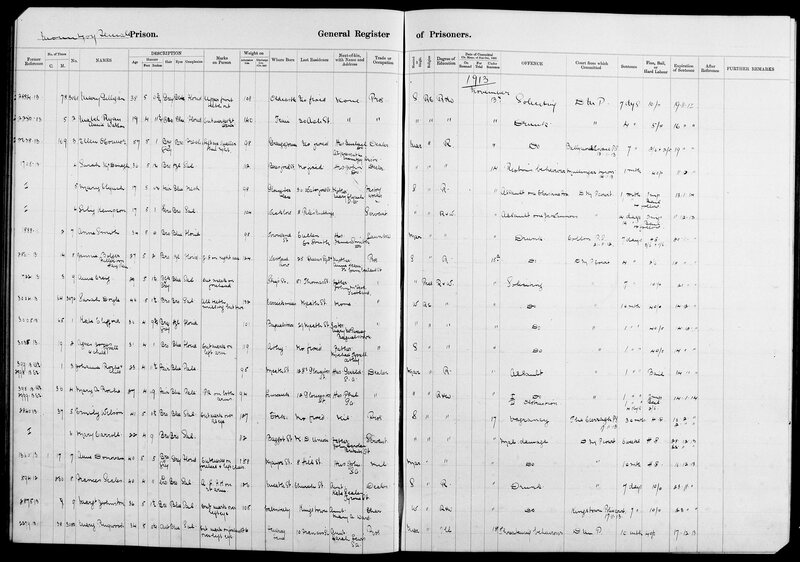 Parts of Lily's Mountjoy prison records, including her intake number, 3066. She was there from Nov. 14-28, 1913. Follow these links to see the three pages of her Mountjoy records: page 1, page 2, page 3. This is the earliest known photograph of Lily (Kempson) McAlerney, circa 1899. The back of the photo lists Martin J. Kempson, James J. Kempson, and another James Kempson, one of Lily's brothers. It indicates the photo was taken in County Wicklow. Additional handwriting on the photo back says the picture is Lily with her dad and two of her brothers, though it's not clear who the other man is. Lily (Kempson) McAlerney, circa 1889. Lily (Kempson) McAlerney at her First Communion at Whitefriar Street Church. Lily (Kempson) and Matthew McAlerney on their wedding day, Feb. 20, 1917. They were married at St. Joseph Catholic Church in Seattle's Capitol Hill neighborhood, and had a brief honeymoon at the Hotel Sorrento. Lily (Kempson) McAlerney in Seattle, 1920. Lily (Kempson) McAlerney on a trip back to Dublin, 1956. Matthew McAlerney and Lily (Kempson) McAlerney, Seattle, late 1950s. The McAlerney family. From top left: Betty (McAlerney) Coger, Jim McAlerney, Matthew McAlerney, John McAlerney, Peggy (McAlerney) Larsen. From bottom left: Alice (McAlerney) McCullough, Matthew McAlerney, Lily (Kempson) McAlerney, Kathleen (McAlerney) McNerthney. Lily and Matt in the 1950s, Seattle. Lily (Kempson) McAlerney and Matthew McAlerney during Seattle’s Irish Week in the 1970s. Matt and Lily were married Feb. 20, 1917 at St. Joseph’s Church on Capitol Hill and remained married until his death in 1981. Matt and Lily at their home in Seattle’s Queen Anne Hill neighborhood, Christmas 1974. Frank Robbins and Lily (Kempson) McAlerney in Ireland and during his visit to Seattle on July 21, 1976. Robbins was part of the Irish Citizens Army and led the group that took the Royal College of Surgeons during the Easter Rising. Others in that group were Lily, Fred Ryan, John Joe Hendrick, David O'Leary, Mary Hyland, and Constance Markievicz. The women were added to the group by Michael Mallin, commandment of the St. Stephen's Green Garrison. To mark the 25th anniversary of the Easter Rising in 1941, the Irish government created medals for those who took part. Medals also were made for those who served in the War of Independence. Lily medal for the Easter Rising is second from left, and her medal for the 50th anniversary, given in 1966, is third from left. The medal on the far right is the Irish War of Independence Black and Tan Medal issued to Frank Robbins. The medal on the far left is Robbins’ the 50th anniversary medal. He gave both to Lily during his visit to Seattle in the late 1970s. These framed medals are now part of the Kilmainham Gaol Museum collection. Lily at her 98th birthday celebration, January 1995. This is a note Lily wrote on the back of the photo of her after taking the oath to the Irish Republic in 1914. The picture with the five other girls was one of the few items she brought with her to Seattle when she came in summer 1916. James Kempson and Esther (Moore) Kempson, Lily's parents. 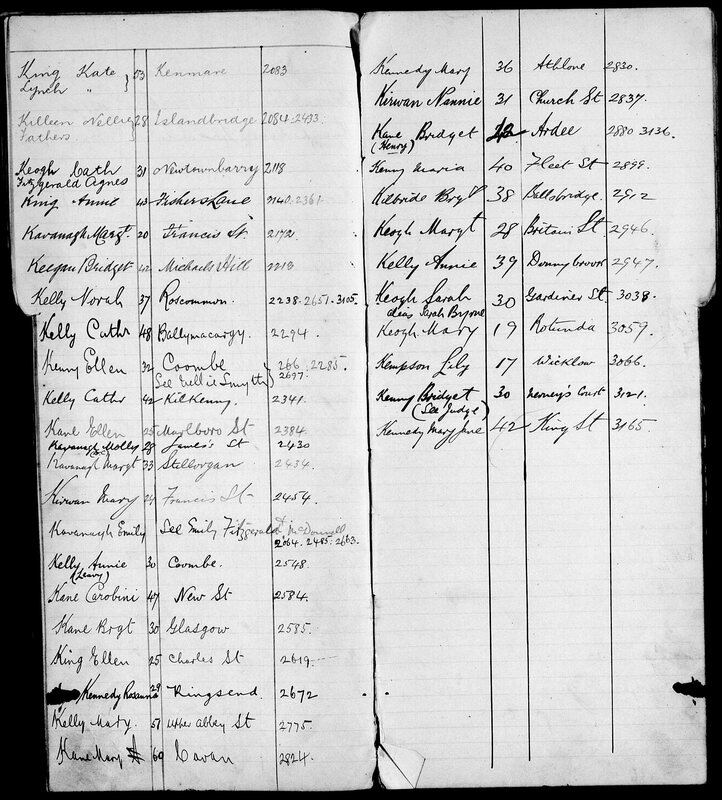 James Kempson, Lily's father, filled out the 1901 Census of Ireland when the family was living at home 3 in Rosbercon (New Ross urban district), Wexford. One section of Lily's Mountjoy prison records. Follow these links to see the three pages of Lily November 1913 records: page 1, page 2, page 3. 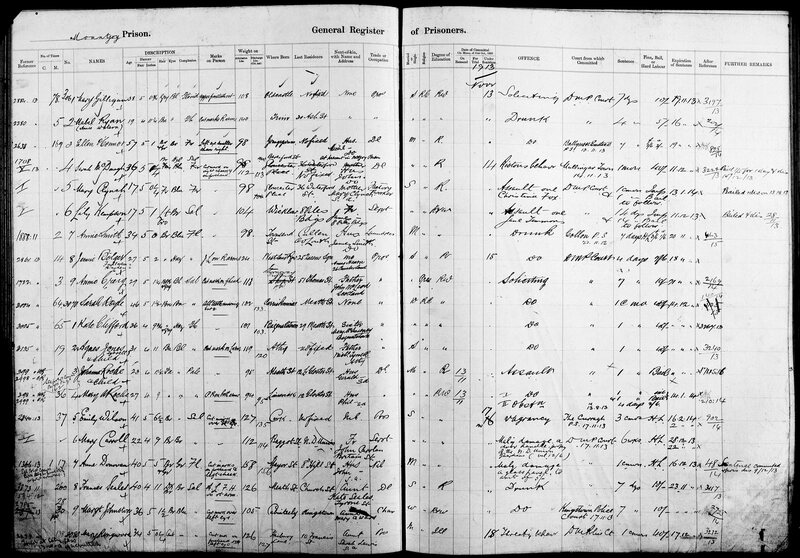 Kempson family information from the 1911 Census of Ireland. Lily, then 14, was listed as "Lizzie," and the form was signed by her father, James. The family home was No. 8.5 in Golden Lane, Dublin.